It is a real unfortunate fact that “church” has hurt the very people it is supposed to reach. The girl that gave in and feels so less then, comes to a church to be isolated because of her choices. The single mom with the autistic son that just can’t bring herself to subject her child to dirty looks because he is “inappropriate” chooses to stay home. The wife that could not be faithful receives pity while the husband is judged as not “being there”. The fact is that Jesus see’s NONE OF THIS. We are to have not only the heart of the Lord, but to see with His eyes. Now if you thought I was talking about the ones that inflicted this judgement, here is a surprise for you. I am speaking to the hurt, the betrayed, the ones that have had their faith smashed by cruel judgements, forced to withstand looks of disdain from the “self righteous”. So you’ve been hurt. Don’t you think Jesus knows? He was betrayed, abandoned, and ultimately crucified. I think He knows a thing or two about pain. I get it. Been there. BUT are you not just as guilty for returning the hurt with your unforgiveness, even bitterness. In fact you hurt yourself more by running from the Body of Christ. You take your hurt and dig deeper into that wound by never healing. You can not and will not heal by running. Fact: God wants His people to love one another. So they hurt you. But have you ever thought that maybe its NOT ABOUT YOU? You are there for a purpose and it’s not for YOU. Fact: No one individual has the total vision for God’s will for His body. There are NO LONE RANGERS that are fulfilling God’s Will or in His Will. Your “opinion” is irrelevant. Your “feelings” are irrelevant. 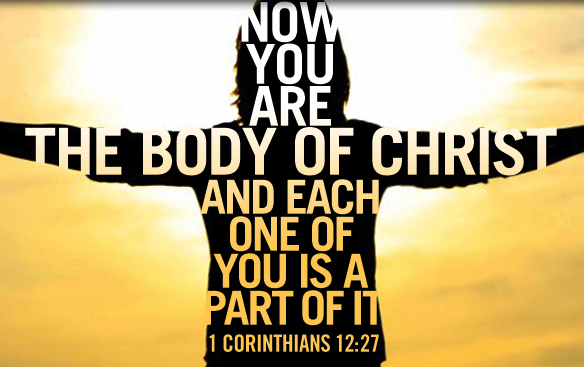 Fact: God adds members to the body as it pleases Him for the common good of the whole body. So who are you to judge a persons’ value to the body? I’ll be frank, how dare you. Do you not see how you insult God when you insult one of His children, one that he brought to you for the good of His will? Do not run someone off simply because you do not understand. Fact: In order for the “Body” to be healthy the members must be healthy. If there is an issue it must be addressed, or like a disease, it can spread, crippling the body. All members are interdependent and need one another. Becoming part of the body of Christ is a covenant relationship. This is the tie that binds. We must acknowledge and seek the role each member is to take part in as the Lord see’s fit. It’s not just as simple as having your name included in the church directory. Likewise it is not just as simple to remove your name either by simply deleting the entry. Whole body life begins when each person is in a right relationship with God, in an intimate love relationship. It continues as all members become rightly related to Jesus as head of the church. Right relationships with God are far more important then the petty things we let get in the way.